Mpumalanga Renovating Maintenance Services (MRMS), a leading cleaning and maintenance specialist servicing the local industrial cleaning, civil, and general construction sectors, has standardised on rental machines from Goscor Cleaning Equipment (GCE) to ensure it receives the lowest total cost of ownership. When MRMS secured a three-year civil site-maintenance contract at Kusile power station in 2010, it purchased its first cleaning machine from GCE, part of the Goscor Group. Following a second cleaning contract at Arnot power station, MRMS decided to rent all its cleaning equipment on a long-term rental basis, GCE GM Greg Venter reveals. In August 2013, MRMS Director F.J. Steyn discovered the Highpoint Vacuum HPVR 1000 cleaning truck showcased by GCE at Bauma, ideal for cleaning operations at power stations and other industrial sites. As a result, MRMS acquired its first vacuum truck. ‘The way the vacuum truck is put together is of a world-class standard. Apart from the fact that I could not import a truck at the same price nor of the same quality, I would face an impossible lead time of 12 months,’ Steyn explains. In addition, the Highpoint Vacuum HPVR 1000 is simple and easy to operate. 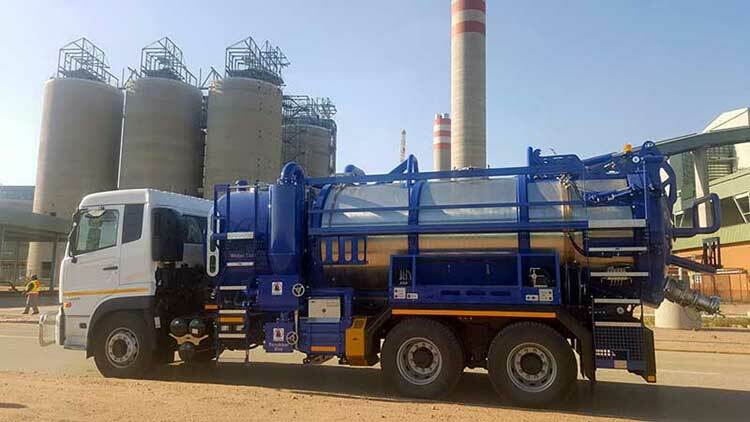 MRMS ordered another two HPVR1000 wet and dry vacuum trucks and received delivery of these vehicles during early 2016 for cleaning operations at Matla, Kusile, and Arnot power stations and other industrial sites. Regular service and maintenance of the machines is key in keeping operational costs and downtime to a minimum. Highpoint is responsible for service and maintenance on the vacuum component of the trucks, which are serviced at a truck centre. MRMS also secured a maintenance contract with GCE, which ensures more output from its cleaning machines in the long run, resulting in maximum availability and ultimately the lowest total cost of ownership. ‘In the event of a breakdown, GCE ensures that the machine is replaced or repaired within 24 hours. I can count on GCE for zero downtime because, irrespective of the hour, it goes out of its way to assist us. With well-trained operators, these durable machines can last at least a decade. My oldest machines look like they are only a year old. The all-round quality I receive from GCE enables me to fulfil all of my customers’ expectations,’ Steyn concludes. GCE supplies a range of wet and dry trucks manufactured by Highpoint Vacuum, a specialist in locally-designed industrial vacuum and jetting systems for standard truck chassis, which are homologated for on-road use in Southern Africa. The success of these vacuum trucks is a direct result of GCE’s four-year partnership, close cooperation, and teamwork with Highpoint Vacuum.